This blog was created for me to have a venue for essays, ideas, commentaries and other writings on transportation and traffic. I actually make a living out of this field and have written quite a bit on transport and traffic. My thesis and dissertation topics were about the jeepney’s impacts on traffic flow. The jeepney is probably and arguably the dominant motorized mode of public transport in many cities in my country. My views here are likely to be based on personal experiences though mixed with knowledge and expertise on my chosen field. From time to time, I will be posting excerpts from papers I have written but mostly I will be making commentaries on almost anything under the sun, of course, related to transport and traffic. Hi! I’m currently writing a thesis about the jeepneys but more on the Industrial organization and economic behavior. I was so happy when I read you wrote your thesis and dissertation about the jeepney. That would make you a jeepney expert then. Is it possible for you to give me advice in writing on this specific field? Thanks! Though I my thesis and dissertation were about the jeepney, these were primarily on the effects of these vehicles on traffic flow (e.g., congestion due to their operations). My expertise is traffic engineering and traffic flow theory was my primary research back in my graduate school days. I did not take a look at the organizational or economic aspects of this mode. Perhaps you can check with the library of the National Center for Transport Studies of UP to check what researches we have done on the jeepney. At present there is an ongoing study the NCTS is implementing for DOTC that covers organizational and financial aspects as inputs to the development of public transport planning support system. The study is targeting completion by December 2011. I recently stumbled on your blog and just wanted to commend you on the content. I was just in the Philippines last January visiting my mother and always enjoy my stay there. I’m also the Vice President of Corporate Marketing for Transoft Solutions, Inc., makers of AutoTURN and more transportation and traffic related software. We have users in over 120 countries around the world including Ayala Land Inc in the Philippines. Earlier this month we released OTISS which is the world’s first SaaS-based trip generation software of its kind. When you have a chance, try the free demo at otisstraffic.com. I would love to hear your feedback! Thank you for the kind remarks. The blog is an ironic distraction for me. Distraction because it allows me to escape work and ironic because my work is in transportation engineering and planning. We’ve heard of AutoTURN from our friends in Ayala but haven’t used the software. Our center at the University of the Philippines currently employs CUBE, HCS, VISSIM, Synchro and the old TSIS/NETSIM. We’ll have our researchers and fellows try out the demo you mentioned. Interesting topic. I find the traffic in the Philippines (e.g., Marikina to Paranaque) quite heavy but I enjoy it more than being stuck in traffic in Chicago or Toronto. By the way, did you go to Lourdes School? If so, we were grade 2 classmates and neighbors in Cainta. Best regards! We were classmates and neighbors! Best regards Jojo. This is a terrific blog, and I’m excited to find another traffic and infrastructure nerd online! I’m no expert, but I have toyed with the idea of leaving my field (video games) to pursue my passion for urban planning and rail infrastructure specifically. I was wondering if you’d have any advice on what schools to attend her or abroad, should I choose to pursue this? There are many good schools abroad including old reliables like UC Berkeley and MIT in the US, the University of Tokyo and the National University of Singapore, but few here in the Philippines. Currently, only UP Diliman offers a graduate degree in urban planning but if you have an Civil Engineering background, you can also try the Civil Engineering graduate programs of UP and DLSU. While, UP’s CE program can advise you on diverse topics ranging from classical Traffic Engineering, Public Transport to Environment topics, DLSU is particularly strong in urban transport planning. Hi. May I know your email address? I just want to consult regarding my thesis. Thank you so much. We would like to ask permission to use your photo of the David Motors LPG jeepney for our Jeepney: Biyaheng Langit book, which will be launched this October. May we ask for your full name and email address so we can ask you formally? Thank you. Best regards and here’s a toast to your book! Hi, just came across your blog a couple days ago and I’ve spent hours reading your posts. I’m a current Environmental Science major but I also have an interest in urban planning and traffic management. Speaking of which, have you played the game Cities in Motion? It’s a mass transit simulation game on the computer and it’s what originally got me into this interest. Just wanted to say great job. I thought people just didn’t realize what the problems were but after reading your blog I know that there were a lot of studies and they were just ignored in the light of extra tax revenues. I hope our governments will shape up and realize the effects of their reckless approvals of commercial and residential developments. Perhaps develop another “metro” region to lessen the population and commuter density of the NCR. One can only hope with our current government. Hi, Nice blog. I was looking for an uv express routes and came across your blog. Can you help me find out where to ride a uv express from Cubao to Divisoria? Thank you. You should be able to find UV express vans along Aurora Blvd and just beneath the LRT 2 station. But why take UV Express when you can take the LRT 2 train? hi. i am mentioning you in my blog and in the interest of fairplay, i am giving you a heads up. thanks! The photo you used is not in Metro Manila. That is a photo taken in Cebu City and is supposed to be part of the quarrel between a former Cebu City mayor and a former governor. The governor is said to have all vehicles in the entourage use the high beam setting of their vehicles even if they were driving in the relatively well-lit roads of the city. I am a student at the University of the Philippines, Diliman, and am currently doing a paper on the sociolinguistic interpretation of the UV Express drivers’ codes. I would like to cite one of your blog posts (https://d0ctrine.com/2014/02/20/from-fx-to-uv-express-a-story-of-evolution/), as it has given me much insight on the history of the UV Express. Could I perhaps ask for your full name to lend my paper more credibility as I list down my references? Thank you so much, and more power to your blog! Hello! I am doing a homework on road safety. Can I ask your permission to use your photo of a pedestrian overpass? (Photo link: https://d0ctrine.files.wordpress.com/2014/06/2014-06-26-12-22-40.jpg?w=960). Thank you! It’s okay. Just refer to the link. Hello sir! Sorry for the very last minute notice. Our Biyaheng Langit jeepney folk art book is out and we’re having a book talk tomorrow at Ateneo Art Gallery, March21Sat 3-6pm. Hope you could drop by. Thank you so much for your input. Hope we could meet you in person. Hi, how can I attribute your photos? I am making a training module on traffic. You can use the URL in the webpage to refer to where you got the photo. I’m currently a UP Civil Engg student affiliated with UP Bike Share, a non-profit advocacy group developing the necessary technology to implement a 4th-generation bike share in UP. Can we kindly consult with you sir, at your most convenient time? I recall that UP Diliman has already revived its bikeways committee comprised of several faculty members from various units. Perhaps you should contact them thru the Chair, Dr Sean Palmiano of the College of Engineering. They’ll be in the best position to advise regarding bike sharing in UP Diliman. sir, I like your ideas, but I don’t see any identification in your about Page. I hope magka-babayan tayu. Please send e-mail if you have time. I need consultant for my thesis too. thanks! I am aware of this blog but I don’t go around commenting on such articles. There seems to be a lot of experts already offering their comments out there. 🙂 A lot of what he stated as solutions are things that have been proposed/recommended for Metro Manila and other cities for decades now. I and my colleagues in academe and the profession have already written and talked about this over so many years. Clearly, a lot needs to be done especially on the part of government. At this point, more than ever, everyone has to pitch so we can feel some improvement in traffic. Infra takes long to build and it doesn’t help when government is not doing its part to expedite development. My main criticisms of nearly all Philippine governments are: lack of follow-through (it often stops with expensive studies and plans and some prestige projects), lack of continuity (projects are stopped because they come from the “other” side) and too little money for preventive maintenance (see the current problems of MRT) which causes stuff that is not so old to be dilapidated after a very short time. I agree with you about follow-through and continuity. I would like to think that the straight path also means to do away with biases against the work of past administrations. Past administrations, like it or not, have also done good work including developing projects that are supposed to be part of the low hanging fruits ready for implementation in succeeding admins. Thailand and Japan change leaderships more often than us but they are able to continue where the previous left of in terms of infra. From what I’ve learned in budget reviews of the DPWH and DOTC, there is available money for preventive maintenance. DPWH is already doing so although there are still some issues that need to be addressed in terms of prioritization. It would be good if that agency can have someone like Sec. Singson at the helm in the next admin. DOTC? Well, we can only hope for the best. My observation is that currently, their mindset is more project development but without a context or strategy. We need strategic thinkers in planning, which like chess requires people to be ahead in the game. We are already far behind and need a sense of urgency in order to catch up. I’m currently doing a small research paper for my English class about the UV express drivers, and I was hoping that maybe I could get permission to use some info found on your blog about it. To be more specific its your blog entry entitled ‘From FX to UV Express – a story of evolution’ it contains a pretty brief history that I think would be of great help for my paper. Hi! Im Aika Rey, a researcher from Rappler. Would like to ask if we can use your photos on roads? 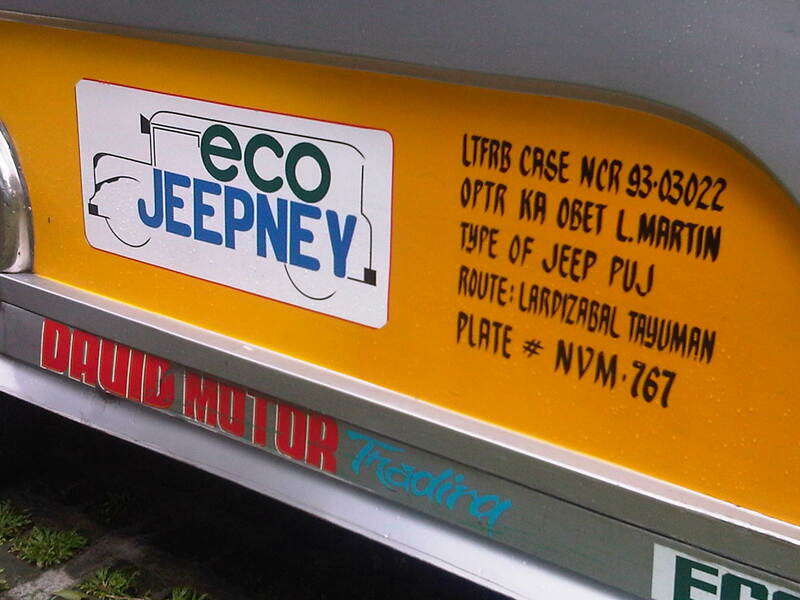 We’re planning to use them for our #OpenRoads campaign, to drive awareness on our Philippine road network. You can reach me at aika.rey@rappler.com Thanks! Ok. I also posted some photos there. Thank you! How do you prefer to be credited? Through your blog address or name? Thank you so much! Hi, I’m Allan Hernandez, an editor at Summitedia. One of our magazines is doing a story on the old rail networks of Manila and Rizal, which you had blogged about previously. Can we email you directly for some questions and leads on primary sources for the story? My email: allan.hernandez@summitmedia.com.ph. Would appreciate your help. Thanks! Do you give talks? I’d be interested to attend one. Hi, we are 5th year architecture students, and currently doing our thesis on Batangas Port. One of your posts that contains pictures in Batangas Port would be great addition to our book. Can we use them? Thanks, i will include your blog to our credits. Feel free to use the photos. Hi D0ctrine, I saw your blog with Mactan Cebu Airport Photos, is it okay to grab it and use for my shop? Thanks! If yes, may we ask when did you take it in particular? The year would suffice. Kindly also confirm if this is indeed taken in Marikina. If not, would you know who took it? May we also have your full name and affiliation? We will be following-up on your response. If you have any questions or clarifications, you may call us at 09957769735 or email us at Purple.ROMERO@afp-ext.com. Thanks and we hope to hear from you soon. I love this blog, and cannot wait to read more of your thoughts and observations on transportation. Hoping for your immediate response. Thank you. What about walkability are you interested in? For Asia-specific papers, you can check out the EASTS website http://www.easts.info where they have their journals and proceedings.